Mark Nunns, Technical Account and Sales Manager at ARA spoke with GISCafe Voice about Bluesky 3D DTM’s coverage that encompasses geographic areas not covered by others. The EA is the UK Government’s Environment Agency, who historically had more extensive data coverage. Were height models used prior to Bluesky by ARA? Yes, DTM data forms a fundamental part to flood models as it provides the base ground layer that water can be moved around upon. ARA work with a range of DTM data providers for different datasets and decided to partner with Bluesky to use its DTM data to enhance the topographic data for non-EA LiDAR coverage areas. Also known as bare earth models, the Bluesky height models were used to enhance ARA’s national scale topographic flood map dataset UKFloodMap. Using proprietary software Flowroute-i, ARA has integrated the Bluesky DTM data to provide an accurate ground elevation surface over which different water flows can be modelled. UKFloodMap includes all primary flood sources, including fluvial (river), tidal (sea, estuary, coastal) and pluvial (flash, surface water) as well as secondary sources such as flood defences, dam breaches and groundwater. Who is the data made available to prior to or during a flood event? ARA work with a wide range of industries and sectors ranging from insurers, government agencies, property developers and asset managers. We provide flood hazard maps and flood analytics to help understand the likelihood and severity of flooding based on historic records of information and also provide live flood warnings through our Flood Watch technology. Does ARA distribute warning information for insurance companies prior to a flood event? Yes, real-time warnings are provided through our Flood Watch system. These systems are currently being effectively used by national governments and also local authorities and infrastructure managers. Is the data easily accessible or do insurance companies need to maintain GIS professionals to access it? ARA work hard to make all its data easily accessible and can tailor the product delivery to specific user requirements. This could take the form of national-scale GIS data layers in any recognised format or the data could be provided as risk databases linked to address data files (Ambiental’s FloodScore product suite). 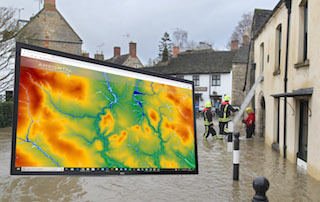 Are the Bluesky DTMs in the cloud – and also is the UK Flood Risk Map available in the Cloud? Yes, Bluesky’s DTMs can be made available in the Cloud and ARA’s UK FloodMap information is available in the cloud. ARA have developed a web interface and API to enable efficient delivery of its flood and other perils data, along with providing easy customer interaction. How often is the Bluesky DTM model updated? UKFloodMap includes two layers of data; depths and velocities, offers a range of modelled return periods from 30 to 1,000 years and can be delivered in a range of formats including GIS (Geographical Information Systems) ready layers and in database or API format, linked to all UK addresses via ARA’s FloodScore product suite. This entry was posted on Thursday, March 14th, 2019 at 7:36 pm. You can follow any responses to this entry through the RSS 2.0 feed. You can leave a response, or trackback from your own site.